Cliff Fendlerbush is a member of the Saxifrage Family. It appears as a small shrub and grows to 6 feet in height and has shiny, dark green, elongated leaves to 1 3/4 inches in length. The plant typically grows on dry, rocky slopes at elevations between 3000-7000 feet. Native Americans used parts of the Cliff Fendlerbush for food and to smoke. 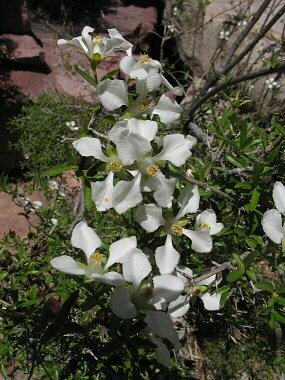 Cliff Fendlerbush typically blooms between March - June and produces large white flowers to 2 inches in width with four spoon shaped petals, followed by a small acorn.